With these words an old article begins the history of Montone; while Mario Tabarrini wrote that the «original Montone would have been destroyed by Goths and that it was rebuilt only around 1000». We know for sure that the first document illustrating Montone as castrum with a castaldo (a steward) – subdivided into two small villages with a parish church, whose properties were placed between the estates of Marquis del Colle (later called di Monte S. Maria) and the ones of the Benedictine Monastery of Camporeggiano – dates back to 1121. On January 1200, the two brothers Fortebraccio and Oddone, Leonardo’s sons, applied for the citizenship in Perugia, ceding their properties right to the municipality and so becoming part of the town nobility, and taking home in the district of Porta S. Angelo. Also Montone was included in Porta S. Angelo countryside, but the signature of this agreement by the town consuls caused the revolt of Olivi family’s faction, opponent of Fortebracci’s, supported by Città di Castello. The subsequent defeat of people from Città di Castello forced Montone’s inhabitants, as the other defeated castles, to take the palio (the city prize) to Sant’Ercolano. The submission was reaffirmed in 1216 together «with the obligation to always bear, in peace as in wartime, the same destiny of Perugia». From that moment on – and for the next two centuries- Montone lingered tied to Perugia, although desired by Città di Castello, until Perugia subdued Città di Castello too. 1368 was a landmark for Montone, because on July 1st was born Andrea Braccio da Montone, the greatest of all Umbrian condottieri (some historians say that he was born precisely in Montone, some others in Perugia). In 1392 he fought side by side with the aristocratic families of Perugia against Raspanti‘s faction, but the latter prevailed and banished from Perugia all the defeated opponents, so that Braccio took refuge in Montone. From there, in 1394 he tried to occupy Fratta (today Umbertide) in order to prevail Raspanti to take it, but he fell into an ambush and took captive. Biordo Michelotti, Raspanti’s leader, freed him but demanded Montone as a reward, therefore the «adventure of Fratta required Braccio’s honour and his family’s feud». Later, Braccio left Montone to serve Florence. After Biordo Michelotti’s death the exiles tried to return to Perugia, so Braccio, in alliance with Bartolomeo degli Oddi called il Miccia, together with a squad tried to seize Perugia, but the town ruled itself to the Duke of Milan as an attempt to defend itself. Later, Braccio served Alberico da Barbiano, who was fighting people from Bologna, then King of Naples, Ladislao. In August 28th, 1414, the antipope Giovanni XXIII granted Braccio and his descendants the perpetual dominion over Montone. In 1416, Braccio assaults Perugia and, after a gory fight, got a crushing victory at Sant’Egidio, so on July 19th he made a triumphal entry into Perugia, where he was praised as leader. Later, he conquered Todi, Terni, Narni, Orvieto, Montefeltro and Urbino. 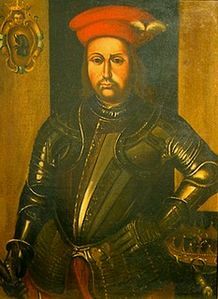 Braccio Fortebracci died for battle wounds after he fought for L’Aquila in 1424. With his death the pope reoccupied the lands conquered by Braccio and in 1478 Montone became the completing part of the Stato della Chiesa: its walls were destroyed as well as family Fortebracci’s dwelling “which was one of the most beautiful and sumptuous of Italy». «At Braccio’s death […] the village ceased to be one of the most important in the Italian Medieval history and the its name occurred far less in the chronicles of the time». Nonetheless, the history of Montone went on and from 1518 to 1640 in the county (promoted to a marquisate in 1607) it was witnessed the presence of family Vitelli from Città di Castello, to whom pope Leone X had given that county as a reward for the aid received in gaining the Duchy of Urbino. The last marquis was Chiappino Vitelli, whose death meant for Montone the subjection to the Church of Rome. After Napoleon, Montone remained a free municipality, while during the Kingdom of Italy it became part of Umbertide‘s district. The construction of the St. Francis Church dates back to the first decade of the Fourteenth Century, but recent researches by Maria Rita Silvestrelli have produced new results about the history of the Franciscan settlement, which now is documented since 1268. 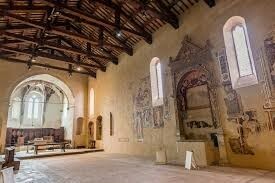 The church is located within the walls of the town, in the place named Castelvecchio, one of the six castles at the entrance of Carpina and Tiber Valley. «Thus, while on the hill called il Monte, dominated Fortebracci and Olivi’s mansions, symbol of war and power, on the other hill, where there was an oratory dedicated to St. Ubaldo since ancient times, Minori Conventuali built their church as an emblem of peace and charity». The church, whose architect is unknown, has the typical body of religious buildings of the Ordini mendicanti: simple and linear shapes, a central single nave with polygonal apse, truss roof. The remains of the oldest frescoes, dated on to the second half of the Fourteenth Century, suggest that since its construction the church has been subjected to a wide decorative intervention, nevertheless the most important ones would be achieved the following century when it became the church of Fortebracci Family, who enriched it with altars, furnishings and paintings. St. Francis‘s Life and Last Judgement scenes are made by Antonio Alberti (from Ferrara), called Braccio’s painter, between 1423 and 1424. The altar in the middle of the left wall was built as an ex voto for the birth of Bernardino, Carlo Fortebracci‘s son and Braccio’s grandson. Bernardino, as you can see on the memorial plaque in the bottom, commissioned to Bartolomeo Caporali (from Perugia) a fresco to complete the altar desired by his father. Indeed Margherita Malatesta, Carlo’s wife, commissioned to Bartolomeo Caporali a gonfalon. In the early years of Sixteenth century the church was embellished with beautiful carved wooden doors by Bencivenni da Mercatello. During the French occupation the complex suffered serious damage and a fire destroyed the extensive archive of the church-convent, which lost of the most part of the documents stored there, apart from all the contents and the frescoes. Today, the church is an integral part of the museum complex that consists in the City Art Gallery and the Ethnographic Museum, besides St. Francis Church. Among the most important works in the City Art Gallery, praiseworthy is the Deposizione, a wooden group coming from the old parish church of San Gregorio Magno out of the city walls, the Madonna della Misericordia painted by Bartolomeo Caporali, Fortebracci’s family trees and Annunciazione by the Signorelli Art School. The Ethnographic Museum Il Tamburo parlante was set up on the purpose to collect and sistematically exhibit the objects from Africa that the anthropologist Enrico Castelli collected during his journeys. Enclosed in a precious silver reliquary, in the past it was kept in the church of San Francesco, while now it is conserved at the collegiate church of Santa Maria Assunta. Many books mention it, but the most detailed one is undoubtedly Lettera istorico-genealogica della famiglia Fortebracci da Montone written by Giovanni Vincenzo Giobbi Fortebracci, who tells how «living count Carlo, since he felt a great attachment to his own country, he wanted to award it by giving a valuable gift, and in 1473 he sent to Montone one of the thorn which crowned Our Lord Jesus Christ, and he positioned it in the church of San Francesco dè Minori Conventuali, where today it is still kept with remarkable consideration and veneration. It is absolutely reasonable to believe that it is the thorn that, more than the others, pierced Christ’s head, and this is supported by a lot of facts, such as being completely covered by his precious blood, two very fine hairs, that seem to be plaited, blood-soaked, overcoming the top of the thorn, and you can see their radicle at the bottom. But what is terrific and marvellous above all, every Good Friday on the hour of his Passion, the Thorn becomes lush again, the Blood dissolves, and you can see small aureate white flowers appear on both sides together, blue and green with some blooms that appear and disappear; as if that precious blood would boil and the Thorn wouldn’t have been dry for thousands of years, but as if it would be picked just now, at this time, from a verdant living thorn thicket. Count Carlo, as Generale de’ Venetiani, received this wonderful Relic by the archpriest of villa di Tugnano, county of Verona, and he sent it to Montone together with its authentication, which I have seen many times as it is preserved in a vellum inside the wardrobe of the Sacrestia de’ Minori Conventuali…». Two centuries later, Angelo Ascani attests that the vellum «now is impossible to find, but this doesn’t detract from the veracity of the transfer to Montone of such a precious relic» adding «let’s leave as they are the legendary flourishing of the wonders happened after its arrival at Montone […] which is a figment of the popular imagination typical of the Seventeenth Century or so». Moreover, he harks back to Annali of Montone that report the feasts started in 1597 for the ostension of the Holy Thorn, while the positioning of the relic inside the silver and fine chiseled reliquary dates back to 1635, as recorded by a parochial manuscript, and it was established to move the feast from Good Friday to Easter Monday ever since. 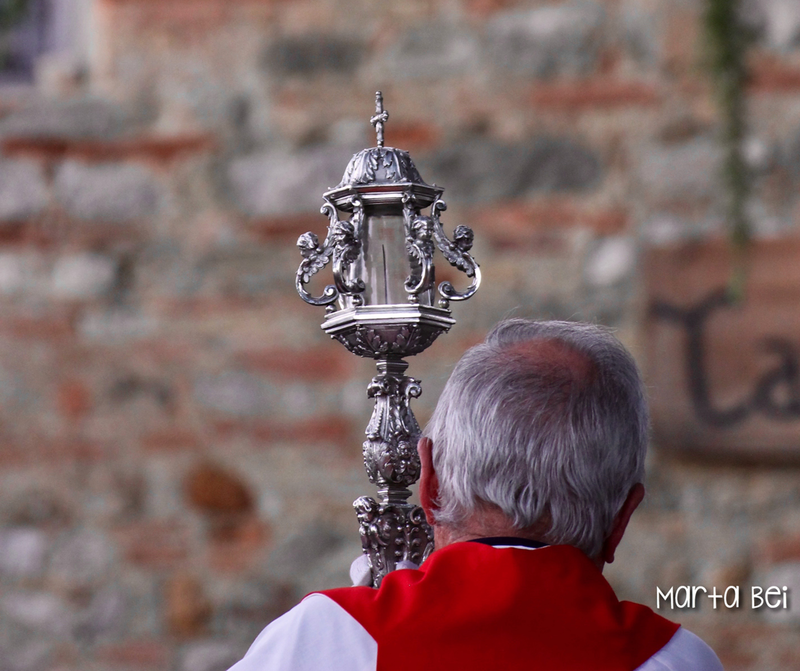 On April 1703, a letter arrives from Rome to the Vice Governor of Montone: «the traditional celebration held there during the second Easter day for the Ostension of the Holy Thorn has attracted a wide audience. So, to prevent any serious disorder, You will order the Captain deputy, as usual, to guard the Gate with twenty-five men and make everyone enters give any kind of weapon.» The historical re-enactment of the Donation of the Holy Thorn was born out of an idea of the association of Pro Loco Montonese in 1961. At the beginning, the re-enactment was tied to the ostension of the Holy Thorn, with the arrival of Count Carlo Fortebracci at the square bringing the relic as a gift to the people of Montone, but in the years that followed the feast has been enriched particularly in the part of the pageant. Also the three Rioni of Montone, Porta del Borgo, Porta del Monte and Porta del Verziere started to be present in the pageant with their banners and couples of nobles. To the Seventies of the Twentieth Century dates back the organization of Palio dei Rioni, which is awarded after a challenge between the archers. Una finestra sull’Umbria. Montone, Spoleto, Panetto & Petrelli, 1968, p. 3. M. TABARRINI, Montone, in M. TABARRINI, L’Umbria si racconta, v. E-O, p. 418. P. PELLINI, Dell’historia di Perugia, Venezia, Giovanni Giacomo Hertz, 1664, v. 1, p. 238. A. ASCANI, Montone. La patria di Braccio Fortebracci, Città di Castello, GESP, 1992, p. 56. P. PELLINI, Dell’historia di Perugia, Venezia, Giovanni Giacomo Hertz, 1664, v. 2, p. 769. P. PELLINI, Una finestra sull’Umbria. Montone, Spoleto, Panetto & Petrelli, 1968, p. 8. P. PELLINI, M. R. SILVESTRELLI, Appunti sulla storia e larchitettura della chiesa di San Francesco, in G. SAPORI, Museo comunale di San Francesco a Montone, Perugia, Electa, 1997, p. 23. A. ASCANI, Montone. La patria di Braccio Fortebracci, Città di Castello, GESP, 1992, p. 250. G.V. GIOBBI FORTEBRACCI, Lettera istorico-genealogica della famiglia Fortebracci da Montone, Bologna, Giacomo Monti, 1689, pp. 84-85. A. ASCANI, Montone. La patria di Braccio Fortebracci, Città di Castello, GESP, 1992, p. 263. Notizia riferita da A. ASCANI, cit., p. 264.